LEXINGTON, Ky. (Dec. 5, 2018) — Choreographer and University of Kentucky dance lecturer Anthony Alterio along with eight UK students and one alumna just traveled to New York City to perform two new dances by the artist. 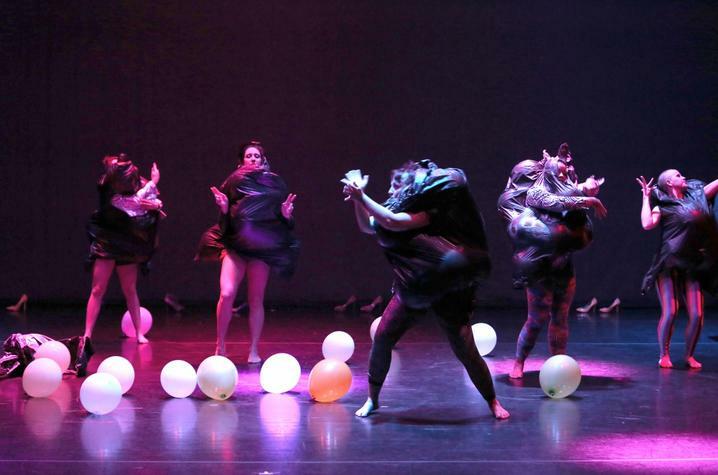 Alterio's dance piece "Road of Excess: Full Blown" was presented at Dixon Place Nov. 28. The piece was staged in the 90-minute program "8 in Show" curated by Sangeeta Yesley. UK dancers Kye Miller, Steven Griffie, Katie Simon, Amber Mulhall, Caitlin Espinueva, Emma Lucas, Tara-Lynn Skinner and Claire McDermott performed. “What is trash realness you ask? Attitude, clothing, femininity, masculinity, physique and youth. This high energy piece showcases eight dancers fusing styles of voguing, waacking, hip hop and jazz to tell a story of a subculture of glam — one that we created together as a cast creating our own version of trash glam. Our identities are trash, our choices are trash, but to us we are glam and unapologetic of our life choices." 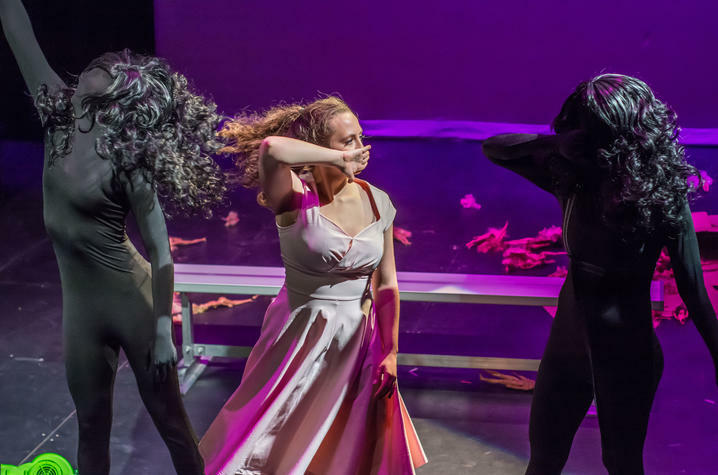 Alterio’s students Miller and Mulhall and alumna Cecilia Pont danced another piece he choreographed titled "Choking Hazard" in the WaxWorks Showcase at Triskelion Arts. This dance focused on a woman portraying multiple versions of "Roxanne," while she is confined to standards that society placed on her. The piece portrays a lesson in femininity and queerness and how it comes in all shapes, sizes and varieties. The lesson emphasizes how labels should not be dictated by popular culture, corporations or even society, but rather defined by the people who want those labels placed upon themselves. "While the piece itself takes place at a bench, the world created on stage is one that many females know too well — objectification,” Alterio said. Two dancers start the dance by drawing the "ideal" body of a woman on a cardboard box while the first ever Barbie commercial is played. During this section of the piece a woman appears who wants to have a different identity than the one placed on her, but socially constructed norms in Western society are holding her back. Eventually, she has enough of these societal roles and gets angry — throwing Barbies everywhere. Then two people with leaf blowers come out to try and blow her back into the box but the woman does more intense movement to make it difficult. Alas the leaf blowers fail, and the woman prevails, demonstrating the strength it takes to be a modern-day woman. The dancers who joined Alterio for the trip are a mix of dance majors and minors on campus. Alterio received two grants, one from the Undergraduate Research Council and one from the College of Fine Arts, to make the trip possible. The trip was also sponsored and supported by the UK Department of Theatre and Dance. Alterio received his bachelor’s degree from University of Colorado Boulder and master’s degree from University of Michigan. As a choreographer and queer performance artist, his work explores and helps represent LGBTQ* dancers. He has performed solo work in California, Colorado, Michigan and New York.